As you've already seen, this vocabulary can be used to improvise a solo, but it can also be used as the lead voice for instrumental songs with a Bluegrassy vibe. 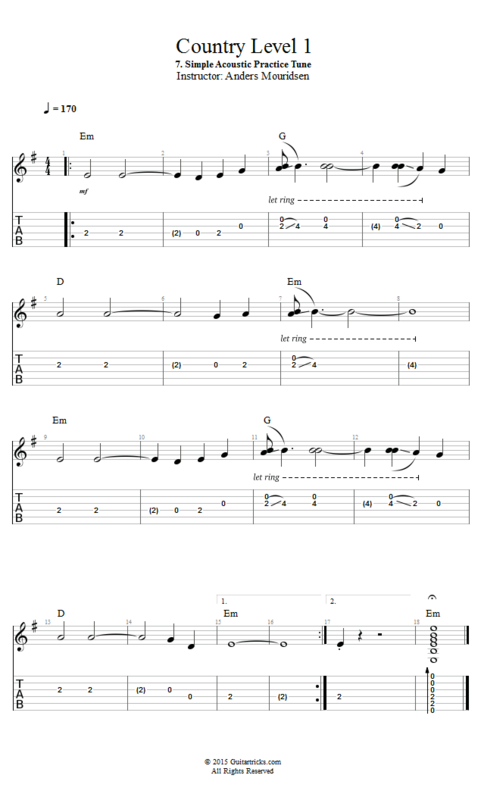 So in this lesson we'll come up with an instrumental practice tune fronted by the acoustic guitar. You can get very advanced with these kinds of instrumental tunes, but for now we'll keep it really basic. I hope these two tutorials have given you a clear picture of what the acoustic vocabulary can bring to the table in a Country context. Once again this is really useful if you play acoustic guitar in a band and want to take a solo, but just as much anytime you're sitting around playing songs with one or more acoustic guitars. This happens a lot in Country, so it's super useful to know some lead vocabulary on your acoustic guitar as well. Have fun with it!